Huh? 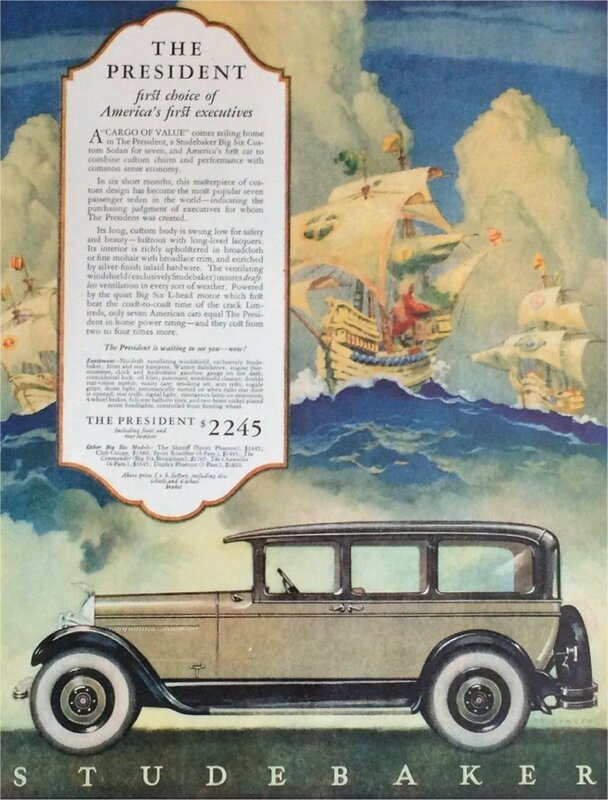 What's a Studebaker car advertisement doing here in a watch post? 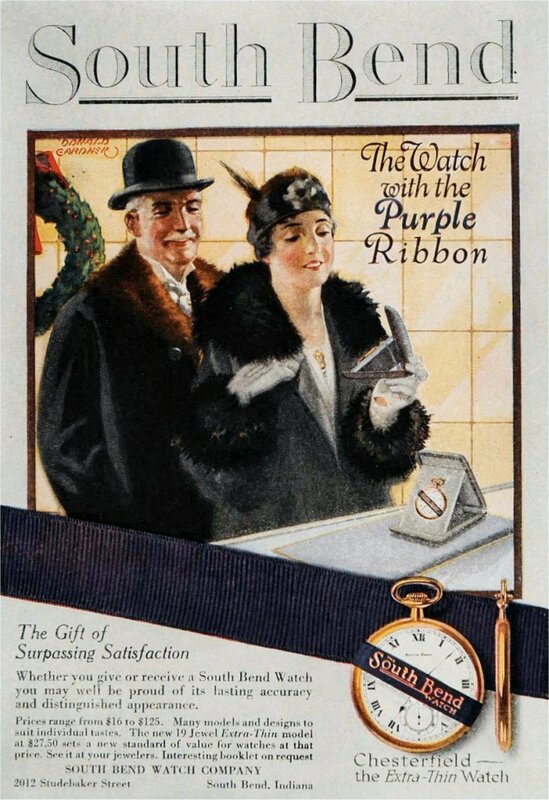 Well, it's from 1928 for a start, the same year as the watch to be featured, but there's a more significant connection than that. In my valiant efforts to sample some goods from US watch manufacturers I have little experience of I acquired my first South Bend watch recently. In 1852 the Studebaker Brothers Manufacturing Company was established in South Bend, Indiana. They went on to produce motor vehicles that gained a worldwide reputation for excellence, eventually ceasing production in 1966. 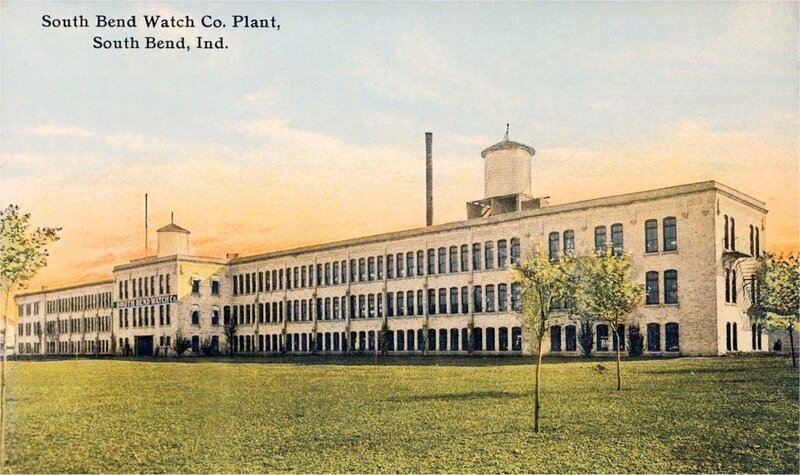 Along the way, in 1902, the company purchased the Columbus Watch Company and after moving to a brand new factory this became the South Bend Watch Company in 1903. A smaller US maker, they manufactured a range of quality watches up until 1929 when the Great Depression finished the company off. 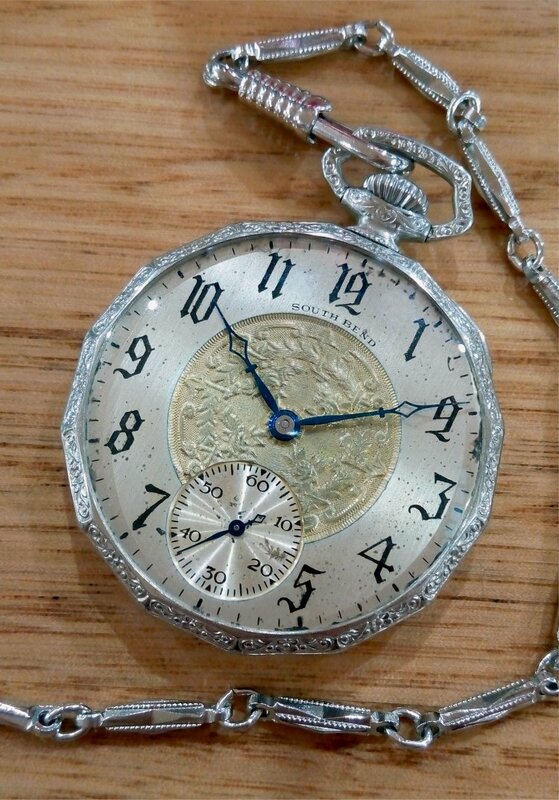 Here's the watch in question - a Grade 439 19 jewel 12 size, produced in 1928. As with the Keystone-Howards I'd been eyeing the various South Bend watches for some years, and again they looked pretty darned good to my eye. However, the proof is in the pudding and so I decided to get some...uh...pudding. I obtained both this 19 jewel watch and another 17 jewel South Bend to taste the waters, or...err...pudding, (if you don't mind I think I might dispense with that simile now). 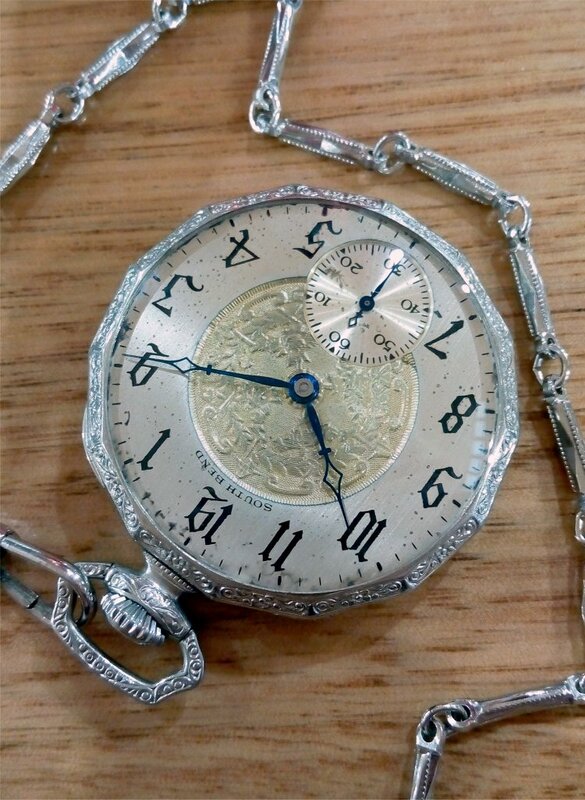 This watch was described in the auction as, "Not working. For parts", but it looked like it was in generally decent condition, apart from not running. The fancy two-tone Gothic Arabic metal dial is a bit spotty but looks quite presentable in the hand. The matching set of blued open-diamond hands were in good condition. 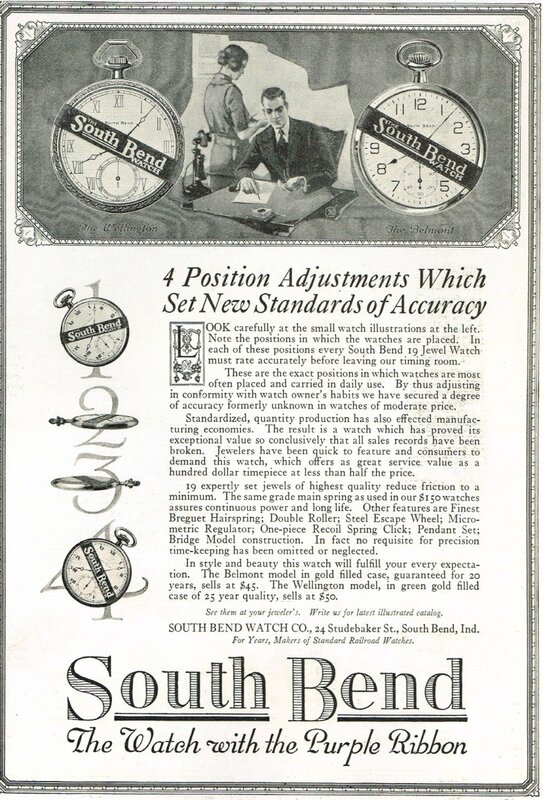 This 1921 South Bend ad extolls the virtues of their 19 jewel movements and illustrates the 4 positions they were adjusted for. 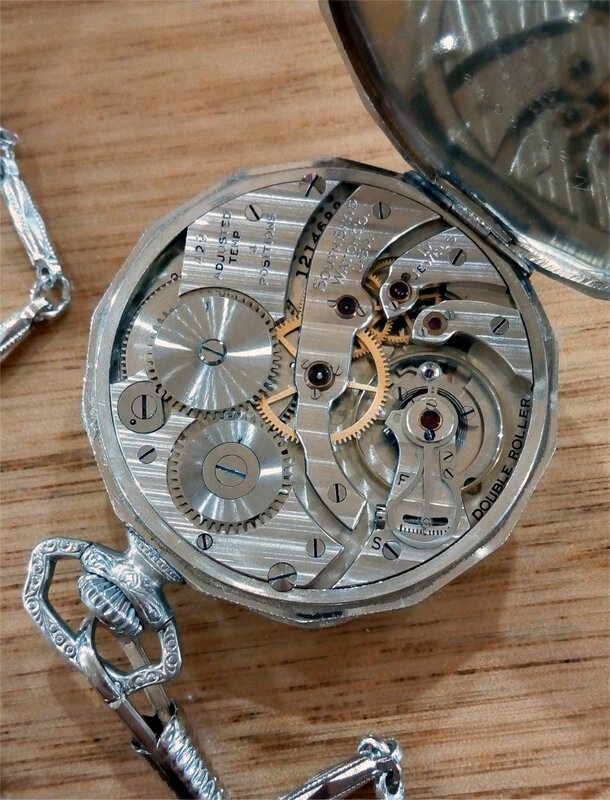 The movement is housed in a 14-sided "Adams" gold filled case made by the Star Watch Case Co. 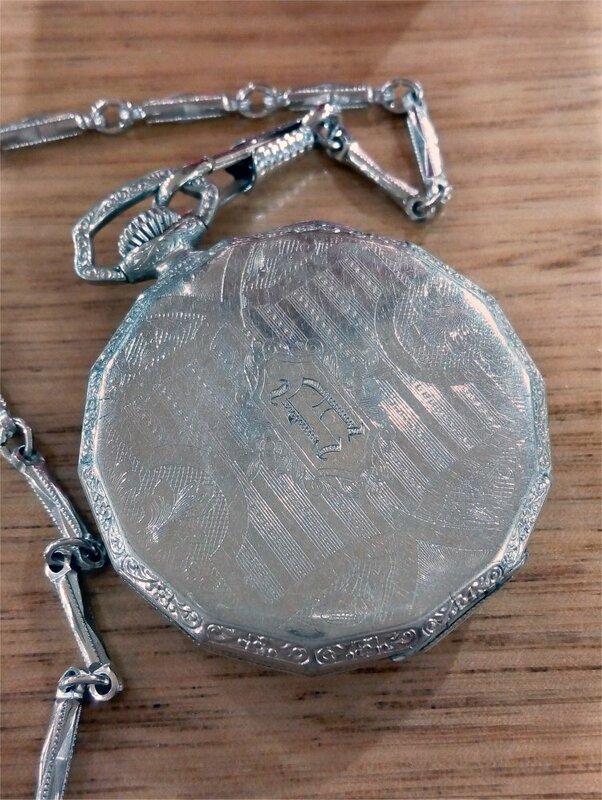 The fancy embossed case measures 44mm in diameter (if that is the correct term for a tetradecagon) and 7.3mm thick. Here's a nice colour South Bend ad from 1916. The watches were packaged with a purple ribbon seal, a feature the company highlighted as a point of recognition.